Sunny California! Does it get any better? Sun, ocean waves, and amazing mountain bike trails! The Santa Cruz Little Bellas Program is the perfect place for kids to get out, get on bikes, and have fun! The Santa Cruz Mountain Bike Program meets on select Sundays at Deleavega Park throughout the fall and is open to girls of all abilities. 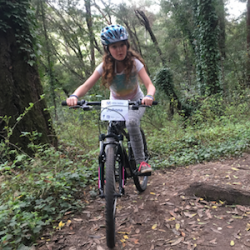 Based on fun, the program creates an environment for girls to be themselves, learn the skills of mountain biking, and build confidence through the different games and activities offered. Riding windy single track, smooth double track, or simply stopping and playing games around one of the many amazing trees within Deleavega, the girls experience a bit of everything. 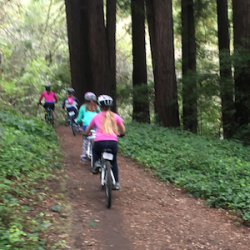 Girls and Mentors (we don't coach, we mentor) ride once a week, every Sunday over the course of 8 weeks. 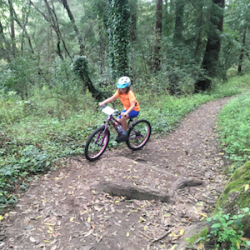 We focus on having fun, using games and different activities to teach basic to more advanced mountain bike skills. 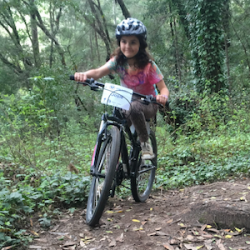 This curriculum is designed to promote camaraderie among the girls, progressive skill learning, and to perpetuate the love of mountain biking, all while having a great time! Scholarships are available so please communicate any financial help needed by thoroughly answering the questions presented when registering. Sara is living and loving life in Santa Cruz. She is a California native but having the best of both worlds in Santa Cruz is something she is super psyched about. Beach and forest, what could better. The perfect setting for what she says is the daily endeavor of expending the energy of her three daughter who are 5, 7, and 9 years old. I can only imagine the energy level and I tip my hat to you and your husband. 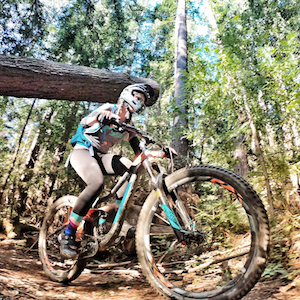 When she does get a little free time, she loves to jump on her bike, rip some trails, and challenge herself, knowing the feeling of accomplishment it can bring. She’s not a fan of heights, loves candy (girl same), and has never broken a bone (girl nope). Before her kiddos, she worked as a social worker with kids from very different kinds of challenging situations who taught her the importance of patience, strength, resilience, and how fun and laughter really are the best medicine. Right there with ya, Sara.